The band’s first major success was with their 1972 cover version of “Zing! Went the Strings of My Heart”. The first disco track they released was “Love Epidemic” in 1973. However, they are best known for their Grammy winning song, “Disco Inferno”, originally released in 1976, becoming a UK pop hit and US R&B hit. After inclusion in the Saturday Night Fever soundtrack, the song was re-released in 1978 and became a US pop hit. The history of the Trammps grew from the 1960s group the Volcanos, who later became the Moods. 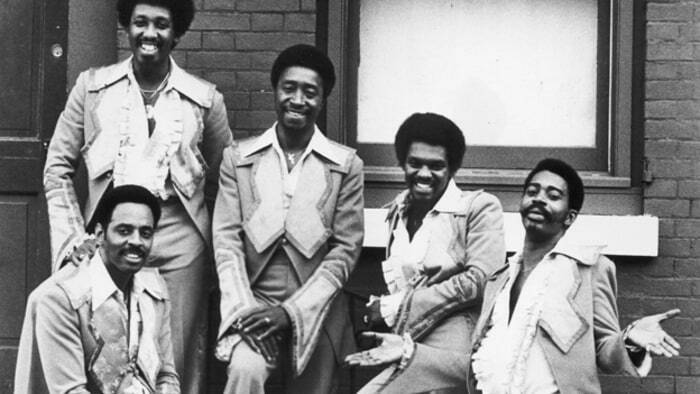 With a number of line-up changes by the early 1970s, the band membership included gospel-influenced lead singer Jimmy Ellis, drummer and singer (bass voice) Earl Young, with brothers Stanley and Harold ‘Doc’ Wade. Members of the Philadelphia recording band MFSB played with the group on records and on tour in the 1970s with singer Robert Upchurch joining later. The group was produced by the Philadelphia team of Ronnie Baker, Norman Harris and Young, all MFSB mainstays who played on the recording sessions and contributed songs. Their debut chart entry came via an upbeat cover version of the standard “Zing! Went the Strings of My Heart”, featuring Young’s bass voice, which became a Top 20 US R&B chart hit in 1972. Their first few recordings were released on Buddah Records, including “Hold Back The Night” which was a hit in the UK and on the Billboard R&B chart in 1973, before a re-release saw it climb the U.S. Hot 100 two years later. Several R&B hits followed during a stay with Philadelphia International subsidiary, Golden Fleece (run by Baker-Harris-Young) before they signed to Atlantic Records. Their single “Disco Inferno” (1976), which was included on the Grammy Award winning Saturday Night Fever: The Original Movie Sound Track in 1977, reached #11 on the Billboard Hot 100 chart in May 1978. Other major hits included “Hold Back the Night” (1975) (UK #5) and “That’s Where the Happy People Go” (1976). In late 1977, the Trammps released the song “The Night the Lights Went Out” to commemorate the electrical blackout that affected New York City on July 13-14, 1977. Their signature song “Disco Inferno” has been covered by Tina Turner and Cyndi Lauper. In addition, Graham Parker covered “Hold Back The Night” on “The Pink Parker EP” in 1977, and reached #20 in the UK Singles Chart, and Top 60 in the US. On September 19, 2005, the group’s “Disco Inferno” was inducted into the Dance Music Hall of Fame at a ceremony held in New York. The song was part-written by Ron Kersey, a producer-arranger and a member of MFSB, who also played with Trammps in the 1970s for a time. During the ceremony, the original band members performed together for the first time in 25 years. Disco Inferno has also had a resurgence and has garnered new fans with the 2016 presidential political campaign of Bernie Sanders in the USA due to the song’s refrain of burn baby burn (slightly altered to Bern baby Bern).